In this page 10th grade geometry solution9 we are going to see solutions of some practice questions. 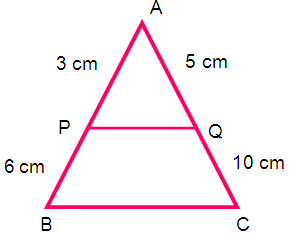 (5) P and Q are points on sides AB and AC respectively, of triangle ABC. If AP = 3 cm, PB = 6 cm, AQ = 5 cm and QC = 10 cm, show that BC = 3 PQ. 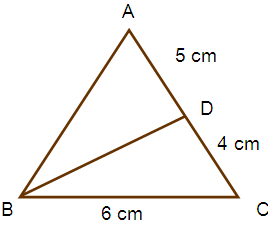 (6) In triangle ABC, AB = AC and BC = 6 cm. D is a point on the side AC such that AD = 5 cm and CD = 4 cm. Show that triangle BCD and triangle ACB are congruent and hence find BD. 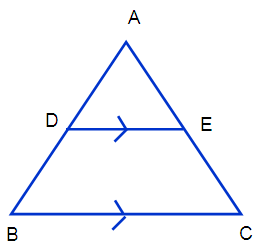 (7) The points D and E are on the sides AB and AC of triangle ABC respectively, such that DE and BC are parallel. If AB = 3 AD and the area triangle ABC is 72 cm², then find the area of the quadrilateral DBCE.